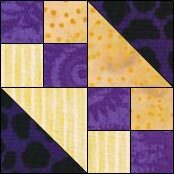 This Hour Glass quilt block looks nothing like the traditional block by the same name—the one that looks like a quarter-square triangle. 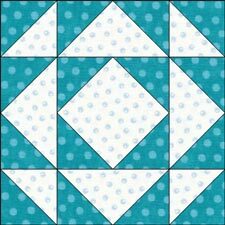 This 3 fabric block is constructed with a Square in a Square (SIAS), Flying Geese and half square triangles (HST) all of which are basic building blocks in quilting. 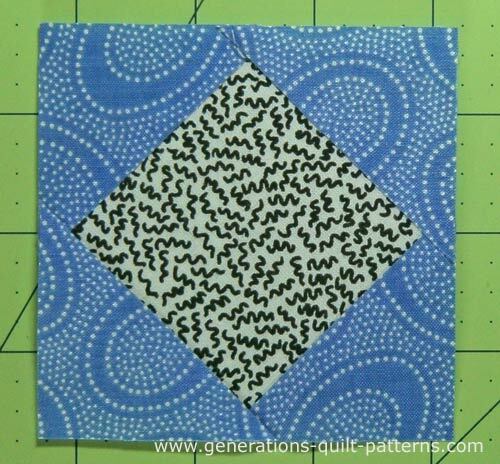 To construct this block you have the option of paper piecing or using a combination of No Waste Flying Geese and Connector Corners. All the instructions are here, as well as downloads for the foundation patterns. 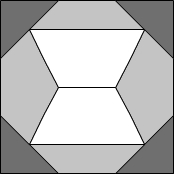 Information on blocks with similar design structure and then a list of blocks with the same name (and instructions when available) are at the bottom of this page. We've got lots to stitch, let's get started! SA are 1/4" and pressed toward the darker fabric unless noted. 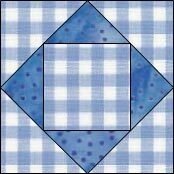 The blue chart is for paper pieced blocks. The dimensions in that chart are cut generously to make the assembling the units almost foolproof. The pink one is for traditional methods that include connector corners and a no waste technique for Flying Geese. Choose one or the other. 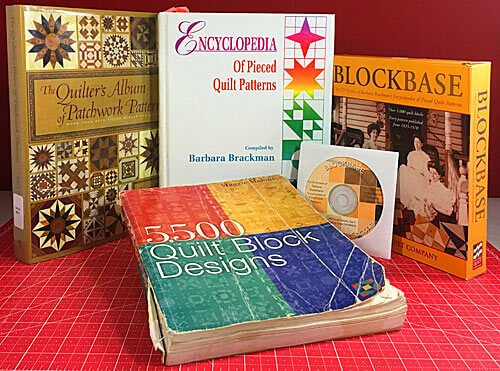 Each is a complete cutting chart for the block. 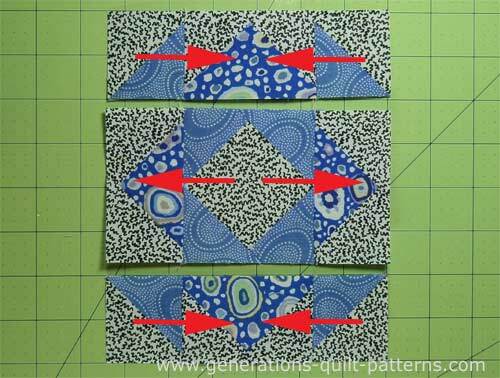 HSTs are quick pieced for both alternatives and the cutting dimensions are exact. My preference is to add an additional 1/4" to shown dimensions for Patch #1 and #1 (they are marked with '**') to make them oversized, stitch the units and cut them down to the 'Trim HSTs to...' size listed in the chart. Perfectly sized units make for blocks that nearly put themselves together on their own. 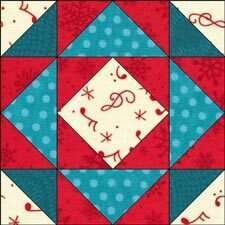 Now that's MY KIND of quilting! 1** A 2 1⅞" x 1⅞" 2⅜" x 2⅜" 2⅞" x 2⅞"
2** BAC 2 1⅞" x 1⅞"	 2⅜" x 2⅜" 2⅞" x 2⅞"
Corner A 2 2⅜" x 2⅜" 2⅞" x 2⅞"	 3⅜" x 3⅜"
Goose B 1 3⅝" x 3⅝" 4⅝" x 4⅝" 5⅝" x 5⅝"
Sky BAC 4 2⅜" x 2⅜" 2⅞" x 2⅞" 3⅜" x 3⅜"
For the 8" finished Hour Glass above, the 'Center' and 'Corner' are both cut 3-3/8" x 3-3/8", that is not a typo. 1 A 2 1⅞" x 1⅞" 2⅜" x 2⅜" 2⅞" x 2⅞"
2 BAC 2 1⅞" x 1⅞" 2⅜" x 2⅜" 2⅞" x 2⅞"
If you cut from the pink chart, skip this step. Otherwise print the foundation patterns from the chart below. 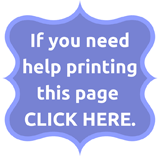 Measure the 1" square on the printed pattern to confirm it is the correct size. Flying Geese 4 1 1" x 2" 1½" x 3" 2" x 4"
SiaS 1 1 2" 3" 4"
Hit the 'Back" button on your computer's browser bar to return here when you are finished. 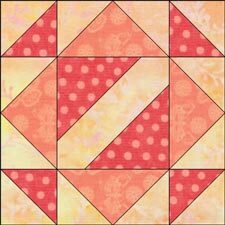 Use the Cutting Chart in Step 1 to check that your Flying Geese are the correct size—the rows are highlighted in yellow. Trim as needed. With RST, layer a #1 and #2 patch. Sew a 1/4" away from the drawn line on both sides. 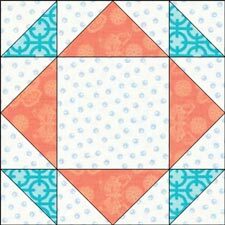 Use the Cutting Chart in Step 1 to check that your HST are the correct size—the rows are highlighted in yellow. Trim as needed. 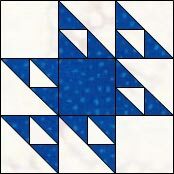 If you need more detailed instructions, click here to go to Half Square Triangles - Technique #1 Quilt Pieced. Hit the 'Back' button on your browser bar to return here. Use the Cutting Chart in Step 1 to check that your SiaS is the correct size—the rows are highlighted in yellow. Trim as needed. This finished unit looks like this. 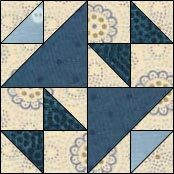 Arrange the pieced patches into the Hour Glass design. 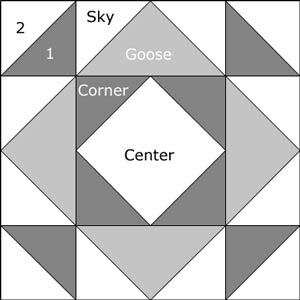 You've noticed, of course, that even though this Hour Glass is drawn on a 4x4 grid, we put it together like an uneven 9-patch. Stitch the rows together with 1/4" seam allowances. Press with the seams in the direction of the arrows (below) to distribute the bulk. Stitch the rows together with 1/4" seams. 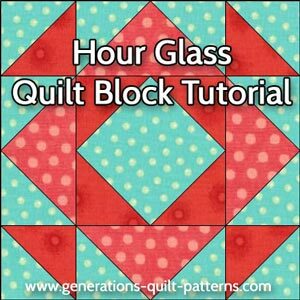 Hour Glass quilt block. Ding! Ding! Ding! DONE! 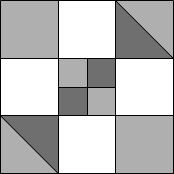 The following blocks are all based on this basic Hour Glass quilt block design, though none are called an 'hour glass'. 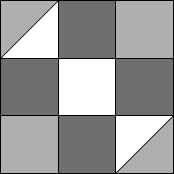 A two color block with some of the lights and darks reversed. The SIAS is swapped out of the center for another unit, the perfect place to put, what else? The SIAS is replaced with a solid patch. 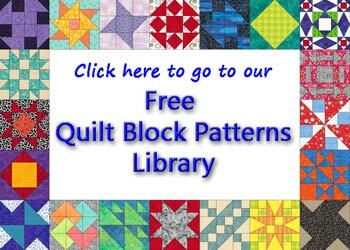 As an 8" block, this would be the perfect place to showcase some of your 4" machine embroidery designs. 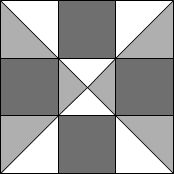 A fourth color is added to the original patchwork design. 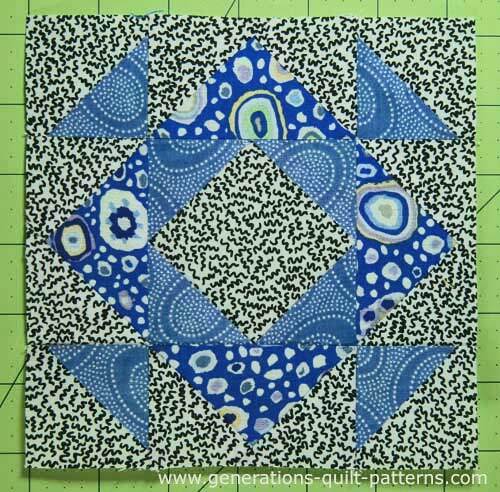 'Hourglass' is a unbelievably common name for quilt blocks. 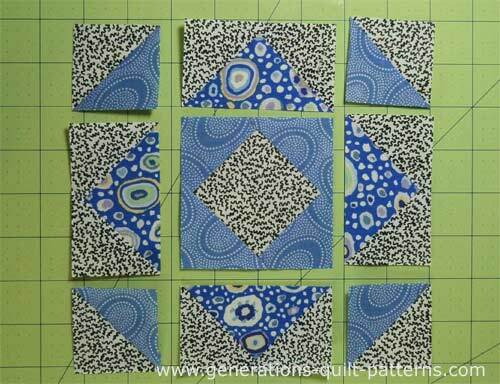 The ones shown below are know as Hourglass quilt blocks, too. 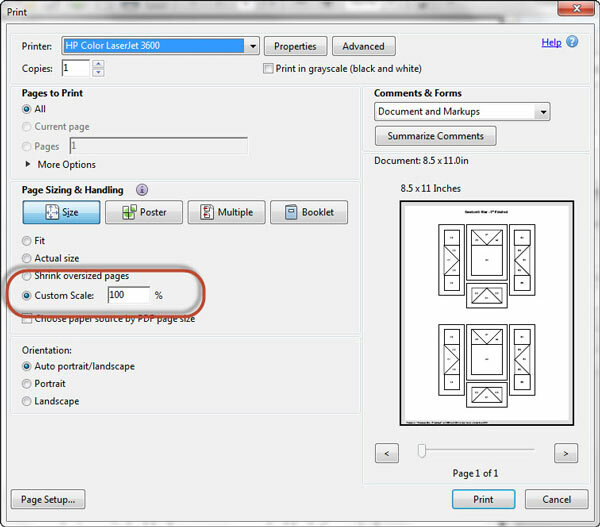 Use your cursor to click on the colored illustrations to go to instructions on how to make that particular version of the Hourglass or additional names for the block. 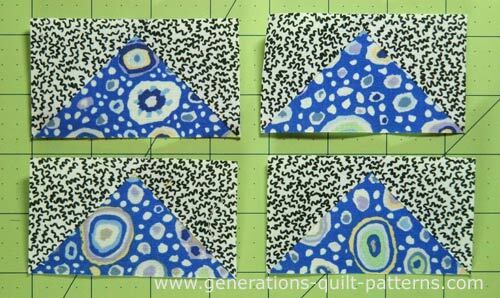 ...and they're filled with all kinds of quilt blocks to make. 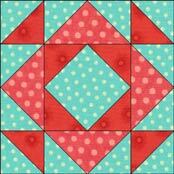 Find more in our Free Quilt Block Patterns library by clicking on the image below!